BeetActive® is a 100% premium quality beetroot concentrate. There are no added sugars, sweeteners or preservatives. BeetActive® Concentrate is naturally sweet tasting and is a great source of dietary nitrates. A single serving of 30ml contains the concentrated juice of approximately 4 beetroots. Mix 30ml (2 tbsp) Bee Active Concentrate with 240ml (regular glass) water. Alternatively, add to apple juice, a smoothie or natural yoghurt. 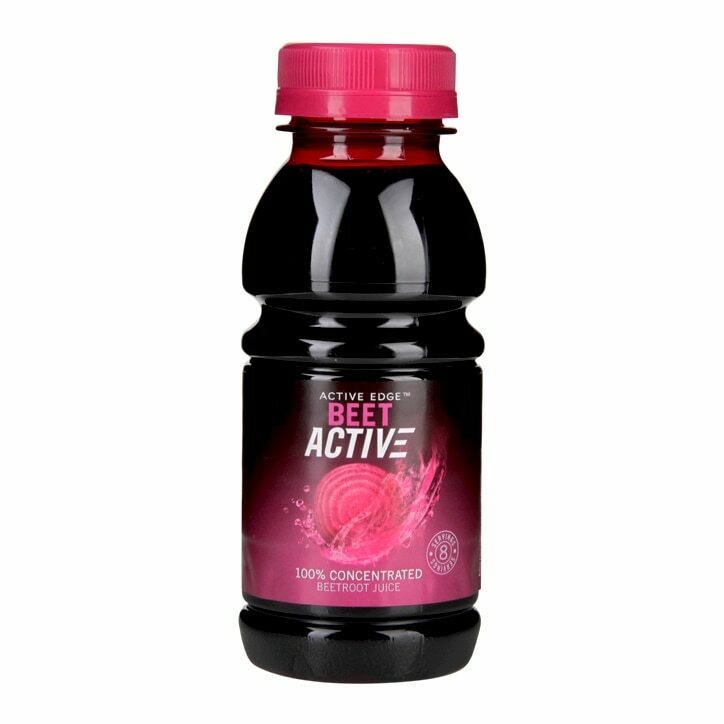 Active Edge Ltd Beetactive Concentrate Drink is rated 4.4 out of 5 by 5. Rated 5 out of 5 by Watch from I Love This This has a really nice taste. I add it to my nutriblasts and it's nice drizzled sparingly as a salad dressing. I have also started adding it to lemongrass tea that has gone cold. You don't need add very much, so it does last a long time. Next time I open a bottle I will dilute some with just a little water and make ice cubes, so then I won't have to worry about the bottle being open for too long before I can use it all. It is a bit pricey, but on the other hand it's a quality product. Rated 5 out of 5 by Anonymous from Good! This is a very good product and I have bought it many times although it is not often available in the shops. It is highly concentrated and of very good quality. Rated 4 out of 5 by Jeno from Excellent This is a very good quality, convenient way to get the scientifically proven nutritional benefit from beetroot juice when you need it. The concentrate lasts well in or out of the fridge and it is ideal for travelling. The only reason not to give 5 stars if they changed the bottle design it might help prevent spillage or staining when pouring it as concentrated Beetroot juice is like ink! But still value for money compared to buying the shots or litre bottles. Not enough people (including staff!) know this option exists and its frustrating it isn't stocked in all branches.